Presiding over the table among some of the world's finest and most distinguished teas are those from Ceylon. Relative high humidity, undulating terrain, cool temperatures, intermittent winds and of course, generous downpours of rain provide a favourable climate for tea growing. The tea growing topography of Sri Lanka is generally divided into three categories, being that of low, mid and high elevation grown, relative to sea level. Excellent quality can be found wherever you look, and elevation alone is not immediately indicative of anything other than the flavour profile you might expect. Unlike some developed economies including Japan and Australia, which rely upon mechanical harvesting due to prohibitive labour costs, Sri Lanka is prized for keeping the hands on the bushes. 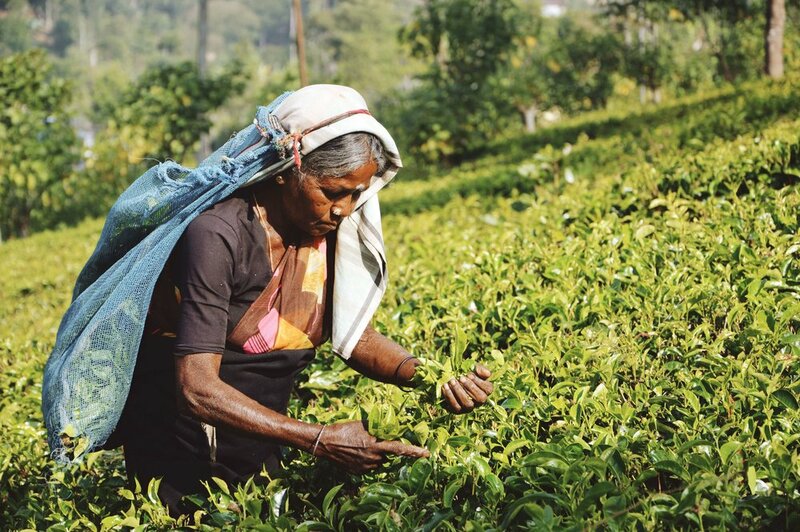 Primarily skilled female pluckers are employed to harvest by hand the two leaves and a bud to ensure the integrity of the final product, especially as the tea trees are grown over slopes and across the contours of the topography. The use of mechanical sifting is still used extensively to sort through the grading of the tea leaves from lowland growing regions. White, green and oolong teas are also produced, as well as a multitude of other agricultural crops, though it is black teas which are a particularly renowned for their smooth bodied and mid-strength profile, bright and clear infusions and fresh taste.